John Sheppard is one of the better-known names from the English renaissance. His music is performed and recorded from time to time. The Sixteen devoted a series of four discs to his oeuvre for Hyperion, and more recently selections from his output were recorded by the Choir of St John’s College, Cambridge (review), the Choir of St. Mary’s Cathedral, Edinburgh (review), and Stile Antico (Harmonia Mundi, 2010). However, it is mostly the Latin sacred music which is recorded. In comparison the music on texts in the vernacular hasn't received that much attention. Therefore the recording of two discs with this part of Sheppard's oeuvre is most welcome. The first volume was reviewed by Gary Higginson. There are two reasons for the relative neglect of the vernacular works. 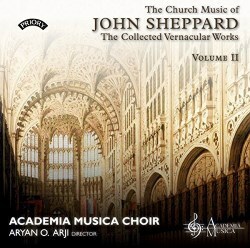 The first is that Sheppard's Latin music "in all fairness, (...) has to be judged superior to his music for the Anglican rite", the unnamed author of the liner-notes admits. The second reason is that large parts of the English music have survived incomplete. Sometimes only a couple of parts are extant and in some cases only an organ reduction by another hand has come down to us. Sometimes the missing parts can be reconstructed, but in other cases the music cannot be performed. The disc opens with a specimen from a part of Sheppard's oeuvre which has suffered heavily: The man is blest is a metrical paraphrase of Psalm 1. Sheppard set 48 metrical psalms, some for solo voice, others for four voices. Only the upper voices are extant; the setting of Psalm 1 could be reconstructed with the help of a keyboard arrangement from the Mulliner Book of the mid-17th century. This is a real shame; the melody which is in the upper voice, is very nice and makes me curious about the other metrical Psalms. The loss of these settings is all the more regrettable as they represent a genre in English music of the 16th and 17th centuries which is little-known and refer to a practice which was quite important. The two main works on this discs fall into the category of the Service, a cycle of settings of texts from the Book of Common Prayer which cemented the break with the Roman Catholic Church and its liturgy. The first disc included The First Service, here we get The Second Service in F fa ut which comprises Venite (O come let us sing unto the Lord), Te Deum (We praise thee, O God), Benedictus (Blessed be the Lord God), the Creed (I believe in one God), the Magnificat (My soul doth magnify the Lord) and the Nunc dimittis (Lord, now lettest thou thy servant depart). Sheppard probably also wrote a Kyrie, the responses for the Creed, but that has not survived. Here we hear a setting by John Brimley who worked for most of his life at Durham Cathedral. According to the liner-notes his setting was intended at the outset to be sung in conjunction with Sheppard's Creed. The Evening Service for Trebles includes only Magnificat and Nunc dimittis. Its name derives from its high treble line which is so characteristic for important parts of English renaissance sacred music. This is another work which is not available in a copy from Sheppard's own time but one from the pen of Adrian Batten made around 1630. It is an organ reduction which includes the outer voices and some indications of the middle parts which are vital for the reconstruction. The booklet includes a rather cryptic comment which I don't quite understand. "We regret that this recording has been made using a transposition down a minor third, which differs from the edition." If this is regretted, then what was the reason to perform it that way? After the two services there follow three anthems. These are for men's voices and their texts are from the New Testament. It is notable that the translations sometimes differ from those in the Book of Common Prayer. Either this was not a matter of concern or these pieces were intended for extra-liturgical use. The latter was certainly the case with the remaining pieces, which are carols for Christmastide. Of all strange news is another piece which has survived incomplete; only those verses which can be reconstructed are performed here. The three Steven Verses were originally part of a longer piece for St Stephen's Day (26 December). These three verses are for three voices, either high or low. A virgin and mother is also a carol; there is considerable doubt about its authenticity, as there is about some other pieces in the programme as well. It has survived in a copy by John Baldwin, the famous scribe who is known for his accuracy in his attributions. However, his attribution to John Merbecke is seriously doubted, especially as the latter gave up composing to devote his time to Calvinist writings long before Baldwin copied the piece. The text is also hardly in line with Merbecke's strong Calvinist leanings. This is a most interesting disc with music which I can't remember having heard before. I also did not know this choir; the booklet includes some information about it, but doesn't indicate how many singers are involved. The picture shows that it is quite large; in his review Gary Higginson counted 24. That is probably considerably more than the Chapel Royal for which some of the pieces sung here may have been intended. In the carols the number of voices is strongly reduced. I could not make out whether these are sung by solo voices. I certainly would have preferred here a more intimate acoustic than that of Gloucester Cathedral. After all, carols were not intended for the church but for domestic performance. The acoustic is less of a problem in the liturgical pieces, although a somewhat smaller venue would have probably made it easier to understand the text. That is another aspect which would require a smaller ensemble. I generally liked the singing. Especially the Services are nicely performed and I enjoyed them the most. That said, some issues need to be mentioned. The sopranos seem a bit overstretched in the Evening Service for Trebles as they tend to be a bit shrill. The carols are the least satisfying part of this disc, not only because of the acoustic but also because here insecurities creep in, also in the intonation which is sometimes suspect. Another disappointing aspect is that the sung texts are printed in the booklet in the original spelling, but the pronunciation is modern. This is common practice, but I find it regrettable that so seldom attempts are made to reconstruct the original pronunciation. Despite some reservations I commend anyone interested in English renaissance polyphony to investigate this disc and its companion, especially because this repertoire is seldom performed and these recordings are good enough to reveal its qualities.